When I consider the United States Army, and the part the 173rd Airborne Brigade plays in it, I picture football. You may wonder how football and defending the United States tie in with each other. I look upon the Army as being a highly efficient team, and the 173rd Airborne Brigade is the 1st string quarterback. As you read this post, you will probably understand why I say this. In today’s post, we are going to provide 25 cool facts about the 173rd Airborne Brigade. Keep in mind that just because it says Airborne doesn’t mean it is just soldiers jumping with parachutes; there is so much more to the 173rd than that. The roots of the 173rd Airborne Brigade go far back. They began as the 173rd Infantry Brigade, and they were organized as a part of the 87th Division at Camp Pike, Arkansas. In 1918, the 173rd Infantry was deployed to France. The Brigade itself never was involved in any campaigns or combat, but soldiers were utilized as reinforcements for units on the front-lines. Just 4 months later, the Brigade was sent back to the mainland and demobilized along with the complete 87th Division. In the 1920’s and 1930’s. The 87th Division along with the 173rd Infantry Brigade were designated Headquarters and Headquarters Company. The 173rd was designated as HHC 173rd Infantry Brigade. An HHC consists of headquarters staff and headquarters support personnel. A drastic change was made during World War II; Brigades were eliminated, so the 173rd Infantry Brigade became the 87th Reconnaissance Troop. The 87th was activated in December of 1942. The 87th began combat operations in 1944. After World War II, the 87th Reconnaissance Troop was put on reserve status and posted at Birmingham, Alabama. The status ran from 1947 to 1951. In 1951, the 87th was inactivated completely. In 1961, the United States Army decided to do a reorganization. This plan was called ROAD which stood for Reorganization Objective Army Division. The ROAD plan put Brigades back into use, and eliminated Regiments. A Division would have 3 Brigades, but there were also separate Brigades that were not a part of a Division. By doing so, the Army could utilize Brigades on special missions when a complete Division was not needed. The 173rd Brigade was selected to become a separate Brigade. 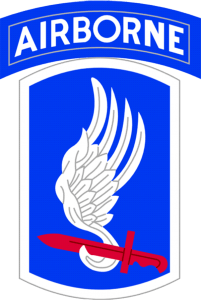 They were also selected to become an airborne task force, so in May of 1963, the 173rd Brigade was reestablished and called the 173rd Airborne Brigade. The 173rd Airborne Brigade had such distinction in the ROAD plan that it was the first Brigade to have support units assigned to it. It was also the only Brigade that would have its own tank company. The tank company was Company D, 16th Armor. In March of 1963, the 173rd Airborne Brigade was activated and assigned to the regular Army, with their station in Okinawa, Japan. The 173rd was Commanded by Brigadier General Ellis W. Williamson who committed his soldiers to heavy training regiments with many mass parachute jumps. In #9, I mentioned the mass parachute jumps made by members of the 173rd Airborne Brigade. Airborne paratroopers from the Taiwan Army were so impressed that they nicknamed them Tien Bien, which means Sky Soldiers in English. The 173rd accepted this as their permanent nickname along with the theme song from Rawhide. The 173rd Airborne Brigade arrived in Vietnam to battle the Vietcong in May of 1965. This was the first Brigade to enter the War in Vietnam. Brigadier General Williamson predicted that the 173rd would quickly defeat the Communist forces, and they would be back in Okinawa for Christmas. Williamson was better at leading military forces than he was at prophesying. The 173rd Airborne Brigade was sent into War Zone D which was North of Biên Hòa, Vietnam. The mission was called Operation Hump. This Operation was full of fierce hand-to-hand combat, and close quarters fighting. During this battle, approximately 48 members of the 173rd were killed, and many more wounded. It is predicted that over 400 Vietcong were killed. There was a famous Country song written about the 173rd and Operation Hump. You can see more in #23. I found it quite interesting that during the complete Vietnam War, there was only 1 combat parachute jump. The 173rd Airborne Brigade made that jump in February of 1967 into War Zone C. Operation Junction City was a huge success, and the Vietcong fled the area. 2 Battalions from the 173rd were moved to the Dak To area to sweep the dense mountain areas. Before doing so, they were warned that the enemy forces encamped in those jungles were better equipped, and seasoned fighters. The men of the 173rd didn’t listen. To make a long story short, the mission in the hills outside of Dak To were disastrous for the 173rd. To use understandable figures, 1/5th of the 173rd was killed or seriously wounded outside of Dak To. For their hard work and bravery at Dak To, the 173rd Airborne Brigade was awarded the Presidential Unit Citation. A total of 13 Medals of Honor were given Sky Soldiers for service in Vietnam. In 1971, the 173rd was redeployed to Fort Campbell, Kentucky. The 101st Airborne Division was also sent to Fort Campbell. It was decided that to rebuild the 101st, the 173rd Airborne Brigade would be inactivated and members moved to the 101st. On January 14th, 1972, the 173rd was inactivated. In the late 1990’s, General Eric Shinseki along with other Army leaders believed that separate Brigades was a good working model, because they could operate without support from higher headquarters. In 2000, the Army reactivated the 173rd Airborne Brigade with the base in Vicenza, Italy. Soon after being reactivated, elements of the 173rd were deployed to Kosovo as a part of Operation Rapid Guardian. In 2003, the 173rd Airborne Brigade would be part of invading Iraq from the North. The original plan was to invade via Turkey, but the Turkish government decided they did not want to allow U.S. forces the ability to use their country to enter Iraq. This “hiccup” didn’t stop the United States Army. In March of 2003, over 900 soldiers jumped from C-17 aircraft to Bashur Airfield in Northern Iraq. After securing the airfield, they landed vehicles and armor. Within 3 days, the complete 173rd Airborne Brigade was in Iraq and prepared for battle. The 173rd moved towards Kirkuk, and in doing so, they destroyed many Iraq Infantry Divisions. During this time in Iraq, the 173rd caused havoc in Iraq defense. They also discovered huge amounts of hidden Iraqi gold. The 173rd operated in Iraq until February of 2004 when they were sent back to Italy. In March of 2005, the 173rd was deployed to Afghanistan. The 173rd performed combat operations in several localities within Afghanistan. The Brigade stayed in Afghanistan 1 year performing many missions that included recon, combat, and assistance to other units. A total of 17 soldiers from the 173rd were killed during this deployment. In October of 2006, the Army built the 173rd into an even more responsive Brigade. This all was due to the Army’s Unit Of Action restructuring. 4 additional Battalions were activated and attached to the 173rd. The 173rd Airborne Brigade would now be referred to as the 173rd Airborne Brigade Combat Team. The idea is to have a complete self-sustained Brigade. In 2006, the 173rd was notified they would deploy to Iraq in 2007 until 2008. At the last minute, in February of 2007, the Pentagon announced that the 173rd would instead relieve the 3rd Brigade Combat Team, 10th Mountain Division in Afghanistan. During their time in Afghanistan, the 173rd had many encounters with Taliban insurgents. In July of 2008, the Brigade’s tour ended and they returned to Italy. 42 soldiers from the 173rd were killed during this deployment. They went back to Afghanistan in 2009 until 2010, and again in 2012-2013. In these 2 deployments, 16 soldiers were killed. In these last couple of years, because of the aggressive actions by Russia, the 173rd Airborne Brigade Combat Team has been deployed to the Baltic states, to Ukraine and to Hungary. Much of this has been assistance to local forces in training. The 173rd has been depicted in many films. The movie Apocalypse Now had the character Captain Willard who was a member of the 173rd. The 1987 movie Lethal Weapon had Danny Glover wearing a 173rd patch. The 1998 movie The Siege had Bruce Willis saying he was in the 173rd. As for song, Country music greats Big & Rich performed the song 8th of November about Operation Hump and the 173rd during Vietnam. Robert Kimmitt was the U.S. Deputy Secretary of the Treasury under President George W. Bush. While with the 173rd, Robert was awarded 3 Bronze Stars, the Purple Heart and an Air Medal. Cardinal Edwin Frederick O’Brien was a Chaplain with the 173rd during Vietnam. Until 2011, O’Brien was the Archbishop of Baltimore. He currently serves as Grand Master of the Equestrian Order of the Holy Sepulchre of Jerusalem. Congressman Charlie Norwood (1941-2007) served with the 173rd in Vietnam with Company B Medical. He was awarded 2 Bronze Stars and the Combat Medical Badge. Private Lloyd McCarter. He was awarded the MOH in the battle to recapture Corregidor Island near the Philippines. Sergeant Ray Eubanks. Ray was awarded the MOH for actions in World War II at Dutch New Guinea. PFC John Barnes III. John received the MOH for action at Dak To, Vietnam. Spec 4 Michael Blanchfield. Michael was awarded the MOH for service in Binh Dinh Province, Vietnam. Staff Sergeant Glenn English Jr. Glenn won the award for his courage at Phu My District, Vietnam. Sergeant First Class Lawrence Joel. It was Lawrence who saved the man the song earlier in this article is about. He was awarded the Medal of Honor for his bravery on the 8th of November, 1965. Corporal Terry Kawamura. Terry was awarded the MOH for his service at Camp Radcliff, Vietnam. PFC Carlos Lozada. I am quite familiar with Carlos, as I wrote about him in a book I have published: Puertorriqueños Who Served With Guts, Glory and Honor. Carlos was given the MOH for his courage at Dak To, Vietnam. Spec 4 Don Michael. Don received the award for his work in the jungle of Vietnam. Sergeant Major Charles Morris. Charles received the MOH for service he performed in Vietnam. PFC Milton Olive III. Giving his life to save others, Milton gained the MOH for his actions at Phu Cuong, Vietnam. Staff Sergeant Larry Pierce. Larry was awarded the MOH when he showed bravery at Ben Cat, Vietnam. Staff Sergeant Laszlo Rabel. Laszlo was given the MOH for service at Binh Dinh Province, Vietnam. Lieutenant Colonel Alfred Rascon. For unhindered bravery, Alfred was given the MOH after service at Long Khánh Province, Vietnam. Chaplain Major Charles Watters. Major Watters was awarded the MOH for his service at Dak To, Vietnam. Staff Sergeant Salvatore Giunta. Sal was given the MOH for his work in the War in Afghanistan. Sergeant Kyle White. Kyle earned the MOH for service in the War in Afghanistan. Staff Sergeant Ryan Pitts. Ryan won the MOH for his service in the War in Afghanistan. As you can see, the 173rd Airborne Brigade has a colorful history. We would love to hear from anyone who was attached to the 173rd. You can leave a comment below. Tell us where, when and any other information. Thanks to all Sky Soldiers!